Main Mobility's wheelchair van service department is staffed with the most qualified technicians ready to answer your questions and address your handicap van auto repair needs. Our auto service and car repair experts have the experience to get your wheelchair accessible van back on the road in top condition. In New York, one of our wheelchair minivan service technicians are available to repair your adapted vehicles, wheelchair vehicles, handicap van or wheelchair lift. The entire list of all services we perform would go on for multiple pages. 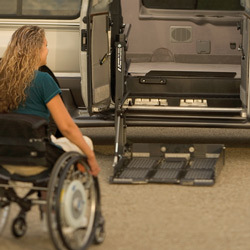 If you have a wheelchair minivan that needs to be modified, repaired in any way, we can help! Our fully trained Mobility Experts specialize in mobility vehicles of all makes and models. There is no project to big or too small. Is It Time To Service Your Mobility Van? You have probably had your oil changed recently and the tires checked. And a tune-up is on the schedule. The wheelchair or scooter is ready to go. You are all set, right? But wait… when is the last time you had adaptive and/or accessible equipment serviced? You know, the ramp or lift, the power kneel, etc. Those need routine wheelchair van service as well. You should have your wheelchair van or handicap van service every six months by a qualified professional mobility professional, but to keep the warranties intact, every piece of equipment requires actual maintenance at different times. All equipment needs to be inspected for damage, alignment and proper operation. Electrical wiring checks include frayed wires and loose connections. It all needs to be cleaned, adjusted and lubricated. If you can’t find your warranty that lists the schedule for each piece of equipment, check with a mobility specialist to find out the specific warranty requirements for your equipment. Keep the inside clean so leaves, debris and dust don’t inhibit the smooth operation of all adaptive equipment. Vacuum the bottom door track of your van every few weeks so leaves and debris don’t build up. Debris in the bottom track will cause the door motor to work harder and even weaken or burn out prematurely. Ensure drain holes are also free of debris. QAP & NMEDA Authorized to perform all service & modifications. Regular maintenance on the ramp or lift is critical to avoid costly repairs. Keep those dates by writing them on your calendar so you don’t forget. Your vehicle will last longer and be worth more at trade-in time. This mobility safety update has been brought to you by NMEDA – the National Mobility Equipment Dealers Association.